57 years ago, the publisher of the US magazine LIFE warned its readers in the cover story Look out for sharks from the danger of shark attacks. Not that the total number would be terrible (because it is very low), but of the cruel attack itself. “During 1959 sharks made 11 authenticated attacks on human beings in U.S. waters. Three of them were fatal. The number is not enormous, but the victims died deaths of horror –dismembered bite by bite as their executioners struck and turned, struck and turned again.“ LIFE Magazine 11. July 1960. 15 years later, a movie managed to spread real fear and terror. From now on, the sea was no longer seen only as a place for leisure and water sports, but as a place where evil lives. This movie was “Jaws”. What many viewers did not know at the time: The film resembles true events. 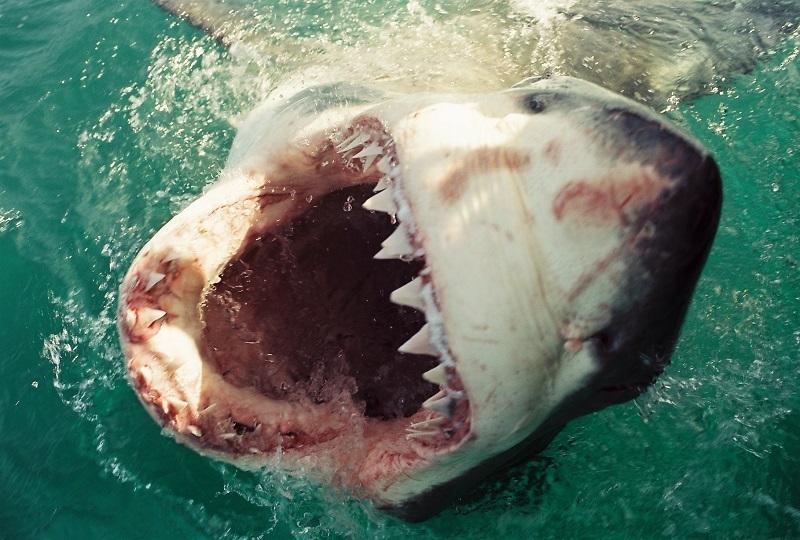 In 1916, a shark on the New Jersey coast attacked five swimmers within twelve days – a man-eater! Even the words “man-eater” are deeply troubling. The term makes millennia of human development null and void and takes us back to our beginnings as pitiful hominids roaming the African steppe, the region where the cradle of humanity stood. They crouched in fire-less caves, always on guard, always in fear that death lurked in the tall grass – or in the water. The idea of being eaten alive violates the dignity of man, undermining the sacred belief that we are “something better” or “the crown of creation,” as we like to call ourselves. Sharks and crocodiles attack people. Among the big cats, leopards are even more feared human hunters than lions, and as the peasants of India and Indonesia know, human flesh is also on the tiger’s menu. Although sharks rarely “eat” people, they are considered to be monsters par excellence – perhaps because the shark is so deeply rooted in collective popular beliefs as no other predator. It is the center of a tradition that goes back to a time long before man began writing down the myths and legends that circulated around the campfire of fishermen. In this sense, the book Jaws by Peter Benchley may be considered a saga in which myth and reality merge. The book reminds of actual occurrences (albeit greatly exaggerated), but reads like an adventure novel. Action and topic make up his success. It does not only give you shivers down your spine, like a good horror story about occultism, it goes far deeper. The film by Steven Spielberg is even worse. Relentlessly, he lets the shark strike again on the American East Coast. He does not just pick up on the historical events of 1916. He depicts the animal with a lot of aggressiveness, strength and human intelligence. A monster. He penetrates into the subconscious and gets stuck there – because you know that the story is somehow based on facts and not the abstruse fantasies of a fanciful Hollywood director. This shark really lived (although doubtful if only one shark was responsible for all of the attacks). His victims were real, normal people. One suffers a kind of metaphysical shock. Are we actually the crown of creation when a fish – a fish! – turns us so fast and easy into simple prey? The idea of being dead doesn’t scare us modern people. But the process and way of dying terrifies us. But one should not ask such a question – and certainly not answer it. Sharks do not submit to humans – and they do not recognize our alleged superiority. And so, it is hard for us to imagine that we, too, can be part of the food chain (and not at the very top) because we no longer feel as a part of nature. In our over-mapped, overpopulated, over-explored world, it’s not often that an animal gives up such mystery. But we do not need to know everything. Some things are in good hands in the fog of secrets and mystery. I am glad that there are still unresolved questions, because after all they are the ones who stimulate the imagination. Christian Kemper is a TV journalist from Germany. He has been diving with and studying sharks for more than 20 years. He has written two books about shark attacks and one book about crocodiles. He is a freelance writer for three of the largest diving magazines in Germany. You can find his German language book Strange Pool Friends on Amazon and at https://tredition.de/. Juvenile bull shark caught in Tennessee River?